If you’re looking for a way to display graphics or smaller periodicals, look no further! Our poster display racks showcase pictures and posters for sale as well as informational literature like diagrams or maps. We sell the artwork holders in a few different styles, each designed to put your portfolio or publications on display. The design of each poster display rack allows customers to easily flip through your selection of artwork, maps, or travel information. Instead of bins where people dig through to find a picture they like, these reference stands make searching simple. The frames are placed conveniently at eye-level for patrons. Sign holders, especially these swinging poster display racks work well in gift stores, art galleries, and at sign shops. What are some of the features of these periodical stands? 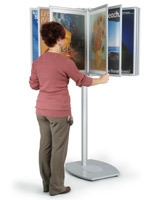 Poster display racks have (10) double-sided graphics frames for users to showcase publications of all varieties. 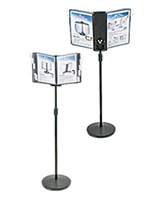 These reference stands are available to house both 22” x 28” and 24” x 36” documents. Every graphic panel contains a protective lens to keep your displays or portfolio safe from damage. This maintains that your posters, pictures, and other material will be for viewing and not touching. These multi-panel sign holders will be like turning pages in a large book for clients and customers. 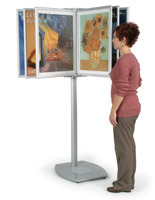 Each panel opens to a full 130º angle for maximum viewing ability. Each organizer has a compact design, making it easy to place in any location. Since these are floor standing, you won’t have to worry about taking up valuable countertop space either! Our binder exhibit stands are a great choice for displaying several pieces of literature in any commercial location. This is especially true with confined spaces because the units use as little space as possible. These reference racks will help employees, consumers, and patrons by putting commonly referenced materials conveniently at hand! We sell the poster displays with everything necessary for production. If you’re looking for other freestanding signage displays, poster stands with literature pockets are another great way to showcase periodicals. Shop online at Displays2go for quick shipping and low prices.